Hey hey Monday! Since I am back at work catching up with ALL OF THE WORK and hopefully at least have my nails done, I am scheduling this with all of my guest posts to ease myself back into it all. Oh, before I begin, all links will be at the end! 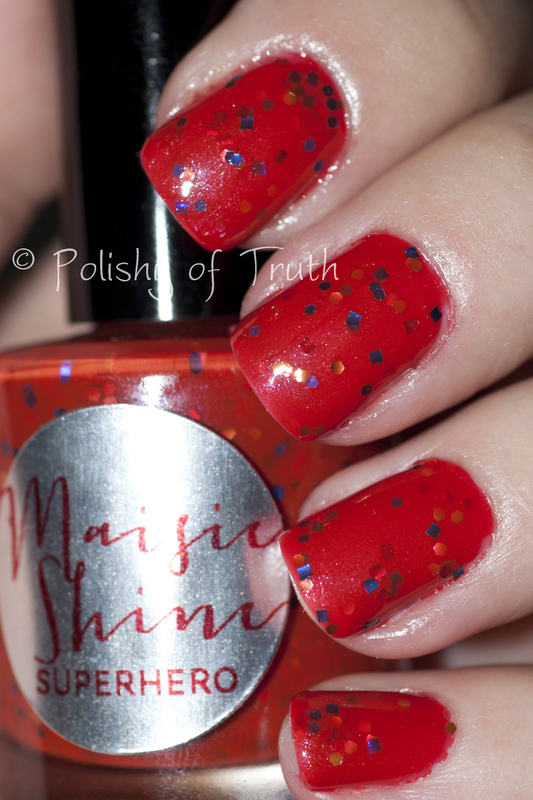 First up, is from a brand called Maisie Shine. This polish is called Superhero, and is a red jelly with small red square glitter, small blue square glitter, blue hex glitter, and gold hex glitter. 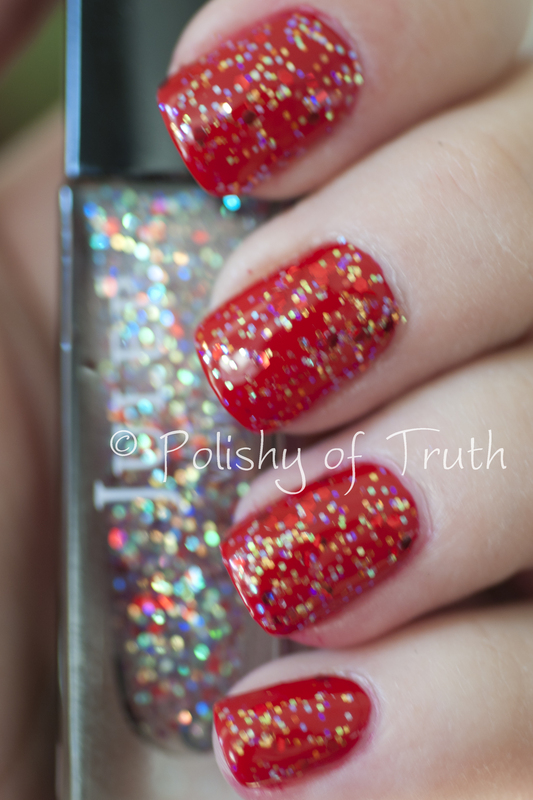 Also, the jelly has a slight gold shimmer to it which is not super-prominent but is AWESOME! Two coats, pretty easy to apply. 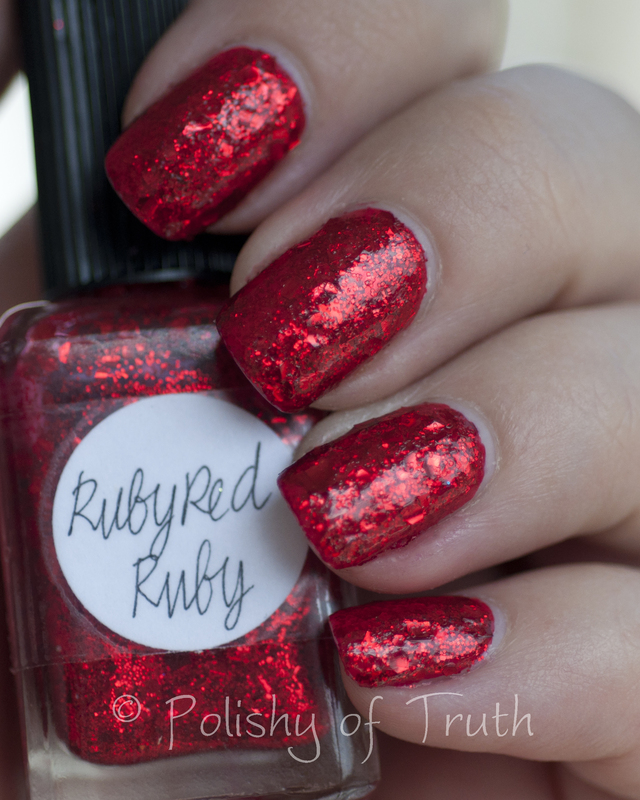 Next, is an older Lynnderella, called Ruby Red Ruby. 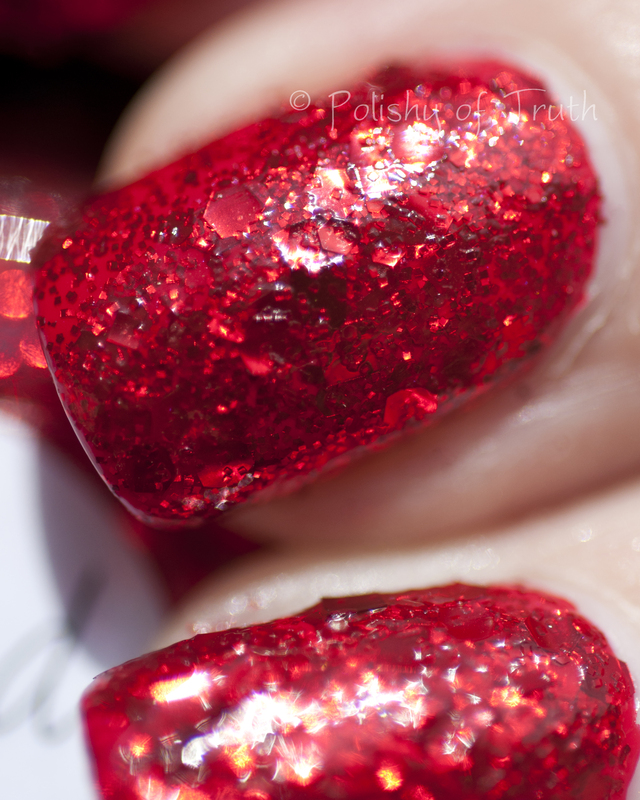 It is a big red glitterbomb of various sized red glitters, flakes, etc in a clear base. So here is something interesting: I wore it on my toes a few times, 2 coats with Zoya Carmen as the base. I ALWAYS got compliments, and I thought it looked amazing. Seriously, Dorothy’s red slippers on my feet! I had this on my toes when I was in jury duty a couple months back, and some dude in the elevator said “I hope I do not sound weird, but those are the brightest, sparkliest toes I have ever seen. Very lovely!” Then everyone of course looked at my feet and all agreed, hahah. Well, I finally wore it on my fingernails for the first time recently, and I HATED it :( I don’t know, I did the same combo as I have several times before, but it just did not look good on my nails. What do you think? Outdoors. It was a grey day, so no sun pics :( But yay to the rain we got that day! And, an honourable mention: This is not an indie, but is is soooo pretty so I decided to add it. This is Julep’s O, Canada! polish – it came out in July Maven Boxes to Canadians, and us US gals could order it as an add-on. It is so yummy! Various sized red hex glitters, gold hex, and iridescent/holo hexes in a clear base. This is 2 coats over RBL Chinoise, which is now my all-time fave red, as mentioned yesterday! Maisie Shine has their own Etsy Shop. Lynnderella, well I guess you can only buy her stuff from her on eBay now. Smitten Polish also has their own Etsy shop! So tell me, what are some of your favourite reds? And some of your fave indie brands? Isn’t it a bummer? But it looks amazing on the toes! 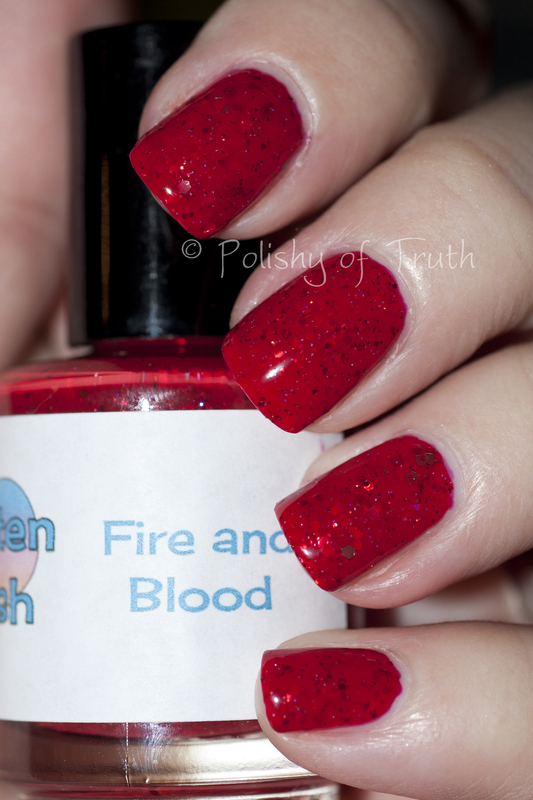 Fire and Blood is a new fave red, for sure! I agree on the Ruby Slippers too. I call it the icky-thick-glitter-blanket-feeling and it’s my main beef with glitter bomb indies. Agreed! And some are soooooo thick and hard to work with, but when they add a coloured base (and a bit less glitter), OR manage to do all glitter but not be SO thick (a few Enkelini ones come to mind, as well as, for example, some of the glitters in the OPI Burlesque collection – I know that is not indie, but as example) they are stunning!!! These are all gorgeous! 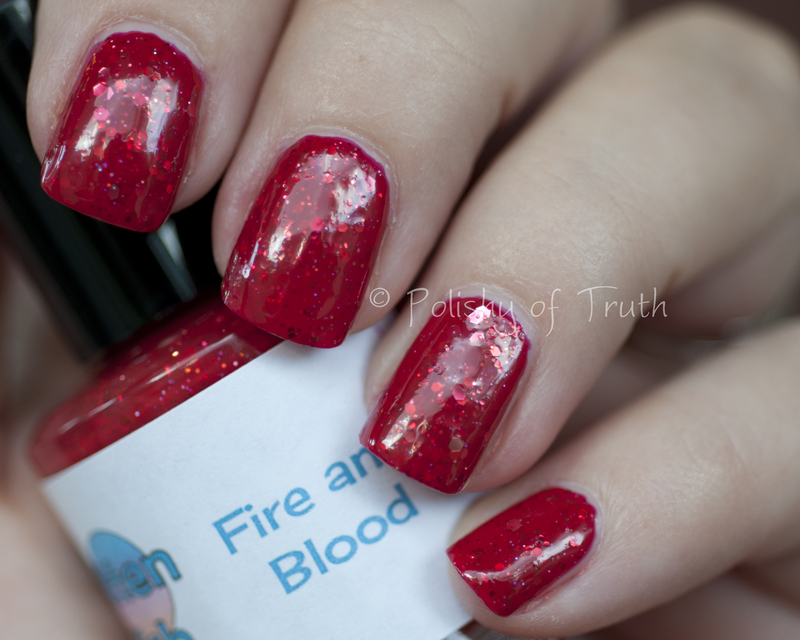 I’m not big on indies but I love red polishes, both glitter and cremes! :) you sure do know how to rock reds!